Kids' outdoor activities and Houston's three digit temps can often be a combination that's precarious, at best. While limiting our kids' whereabouts to the pool and indoors seemed like a viable option, it was limiting and didn't set well with the soccer coaches. Our quest to keep our kids hydrated led us to a genius invention; we loved it so much we wished we'd created it ourselves. 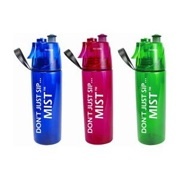 The O2 Cool Mist N Sip Hydration Bottle does double duty as both a drinking and a misting bottle. Colors that please boys as well as girls, 20 ounces of water capability, and a price tag that allows us to purchase for the whole family took this baby to the top of our cool stuff list. Available at Academy and amazon.com.